Some may remember a series I’ve been struggling with called “Blood and Vapor”. * Suffice it to say, I continue to struggle with four paintings in this series that I am working simultaneously. Each touches upon a different aspect of the theme. This one is on the periphery and explores our ties to the inevitable crossing between life and death. “Blood And Vapor”: Who lingers within you? Have you ever felt an ancestral presence? The inescapable tie of family:hundreds of individuals, yesterday and today, here and gone. A powerful resonance or inconspicuous vapor? An ancestral presence is an interesting way of presenting your idea. Your art looks very deeply inspired. this is hunting ! very good piece, Elena! I have been looking at this piece several times , and still it stays on my mind. Also your latest “Stirring” ….so gooood! Love the quote and humbled by your comment. Thank you! Although I would like to travel with them, I pity that couple of innocent souls who seem have borrowed the Charon’s boat to journey across the river Acheron. They remain unaware that it is a no return trip. The more I struggle, the more I believe that there is no light sufficiently strong to dispel the darkness that envelops the mystery of death. Our ideas are just small candles that blow out even before we can glimpse some answer. Oh Marcelo, I don’t know of anyone else who could color the ultimate experience using only a few words, the way you just have. Let’s light those candles. This is amazing! Such clever use of distortion and persepective, given the theme. Very thought-provoking piece. I love this series…so love how your creative mind works!!! This is something else, I’m blown…I saw it the other day..had no words. I recorded interviews with my relatives, to find out who I am, why am i what I am…and this resonates totally. Your struggle is evident. Awesome! Wow, excellent idea to interview and record stories from the perspective of you family. I wish I’d thought of that. Thanks much for taking the time to absorb the content. Appreciated Arjun! Wow, I didn’t even know what to say about this one! But I am back to give it a shot. The stretched perspective is so eerie! Beautiful figures and colors, of course. So rich and spooky and full of storytelling! I very much appreciate the second look and the effort of taking it in. Thanks very much Cindy! Like a macabre fairground ride – so probably close to the experience. Lovely painting, Elena! wow! it is very, very nice! Mysterious and intense anguish! very well done! Thank you very much Daisy. I remember the series well, so nice to see you revisiting it. Perfect colors in creating an eerie feel to the scene, I especially like how you’ve exaggerated certain aspects of girls bodies (feet and arms/hands) very effective. Wow! That’s some powerful work Elena. Superb! Thanks so very much Adrian! Wow! This is amazing- Very striking and dramatic! Wow. Such a powerful painting Elena. The red to me is absolute blood and veins, stretch and sinew..I can almost see the white of deaths teeth.. also somehow I feel the quick rush of life, the pushing forwards, continual motion..having gone through the pain of grief recently this painting resonates very strongly.. Thank you Cath. Yes, I absolutely intended all that you have so ably discerned. I have been wrestling with grief/mortality too ( I’m personally ok). Though this piece is not much in the comfort arena, I am working on one that approximates another aspect of the theme. I do however, feel the urge to engage with the primal helpless intensity of the matter first. Sending you the good wishes this piece is not communicating. I always appreciate your insightful comments. It’s such a grand (and daunting theme). I haven’t seen the rest, but it looks like you’ve got something pretty promising here! Your support is very much appreciated. Thanks so much! When I opened this I said “whoa!” The colors — the drama! I love it. Thanks Sandee, means a lot! Very powerful addition to the collection. Beautiful work. I love the delicate detail of the background image. Thanks so very much Allyson! A strong concept and composition. The feet are quite expressive, with that bright white bringing them closest to the viewer. Powerful. What an ambitious (and cool!) concept! Yes, I do feel that presence from time to time. I respect the ancestor veneration practices, and we try to do our part with incense and joss paper (though we need to be better about it). The perspective and colors in your painting fit the idea very well! Thanks very much Jeff! So very interesting to learn how each of us reads, feels and reacts to the series. Yours is a wonderful tradition. So powerful. I love the distorted perspective and the wispy skeleton is perfect. At first glance I thought they were on a fairground ride rather than a boat. I think that’s because it gave me the same off-balance, semi-terrified, semi-excited feeling that I get from a fairground ride. Can’t wait to see the rest. Oh, I love the fairground reference for all of the reasons you’ve relayed. Thanks so much Sarah! The combination of distortion and universal symbols is highly effective. Not to be recommended before going to bed!! Another emotionally charged painting in your Blood and Vapour series Elena . Thank you Poppy. You’ve tapped into it beautifully. This is haunting and beautiful, Elena. The perspective is edgy, a feeling of tension and hanging over a precipice or unknown void . Yes, yes! It’s the perifery for sure. And that sinewy skeleton character is wonderful, sort of unknown in its intentions. Karen, thank you for bringing up the skeleton creature. Unknown and sinewy works so well for me:) Much appreciated. Elena, this is quite profound in my humble opinion. The emotion hits right in the gut and probably explains why it is so difficult for you. As soon as I laid eyes on it, I thought of the many stories from my aunt and others about the treacherous journey many Americans of Cuban heritage undertook to get here. So many of them were children in rickety boats. But a second look made me realize why I could never work in pediatrics as a nurse. Loosing children is just so painful. I hope you find the emotional energy to continue though you may find some people are unable to handle the depth of the emotion so very visible. This is a really beautiful painting!! Many thanks for your important comments. The reality of children passing is nearly impossible to cope with for most of us, I think. 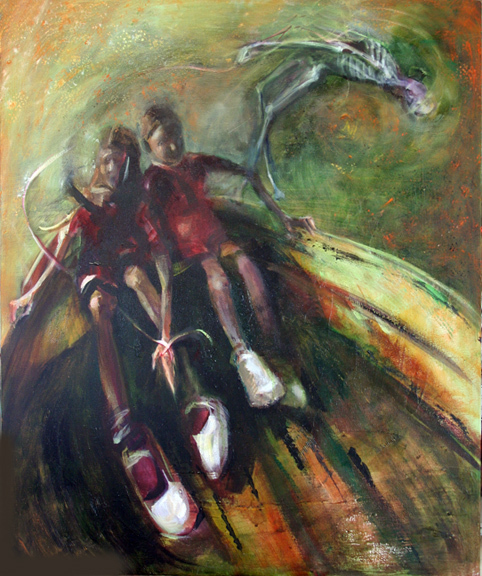 The children in my painting represent each of us at our most vulnerable. Refugees are the living metaphor for the ultimate passing;the whirlwind of fear, hope, helplessness but also dignity and courage. I am awed by your ability to comprehend what I am after in this painting by likening my intentions and emotions to shades of similar transitions and passages. I’m not sure it’s a very good “painting”, but I am pleased that it has communicated what I struggled to bring across. Again, thank you for taking the time and energy to respond. in my past —– ? ? ? —– or was that a scene in a film ? ? ? Ah, I’m pleased that it resonates Yoshi. Thank you! I like it very much Elena. With its intensely mortal topic, I would be struggling too; hang in there. It’s not a crowd pleaser, especially on a Monday:) I don’t even know what to think about it except that I need to keep trying. Thanks very much Jet! Your words ‘struggling’ had me asking straight away, if YOU decided to do the work but the muse does not wish to cooperate, why not put it down? I find that I am nearly never pleased when I decide, creation comes through me, not by my own decision–unless I decide not to cooperate and then it’s just all lost. You don’t need to answer me. I just shared what I thought of first. Now I am thinking of frustrating ideas and paintings inside my head that I have NO skill nor materials to get it out. Sometimes I choose to focus on this and I can get irritated. This irritation can wreck my day. It can also cause me to miss the sideways brainstorming way that I CAN express the image in my head, but the image might not be like a photograph.